As most of you know I am currently saving for a deposit to buy land and build a cabin. Well, we have an exciting update. It looks like my boyfriend and I may have found the perfect block of land! Although, the block of land is a little out of our price range so we have decided to keep saving for the deposit because we want to avoid borrowing more money from the bank than we have to. In the meantime we have been working on our interior style, and whilst we don’t want to go out and make any big purchases at the moment, we do want our current living situation (a two bedroom apartment by the beach) seriously epic. We’ve been making a few smaller purchases for our bedroom, living area and office, and have been very strict with those purchases, as we want to make sure we can use them in the cabin. When we recently went looking for a rug for the bedroom, it struck me how possible it is to update a space by making a few small changes. We don’t have the luxury to do what we want with our apartment as we’re renting, but it’s been a welcome challenge. With this in mind, I thought I would share 13 stylish ways to update your bedroom on a budget. BRIGHTEN IT UP #ihavethisthing with exposed light bulbs. Seriously. I love how minimalist they look and how they take up next to no room. They are also one of the most inexpensive items to update a bedroom. If you’re like us and can’t find any bedside lamps to suit your style, mix it up and use exposed light bulbs. And if you have a bedhead, considering hanging the cord over it like we did, or suspend the exposed cord from the ceiling. Get as creative as you want. And remember, it’s all about the cord. The best part? If we get sick of the cord colour, we can easily replace it. For inspiration, take a look at my favourite exposed lighting styles here. SAY IT WITH ORNAMENTS Ornaments are the perfect bedroom updaters without going too crazy on your budget. 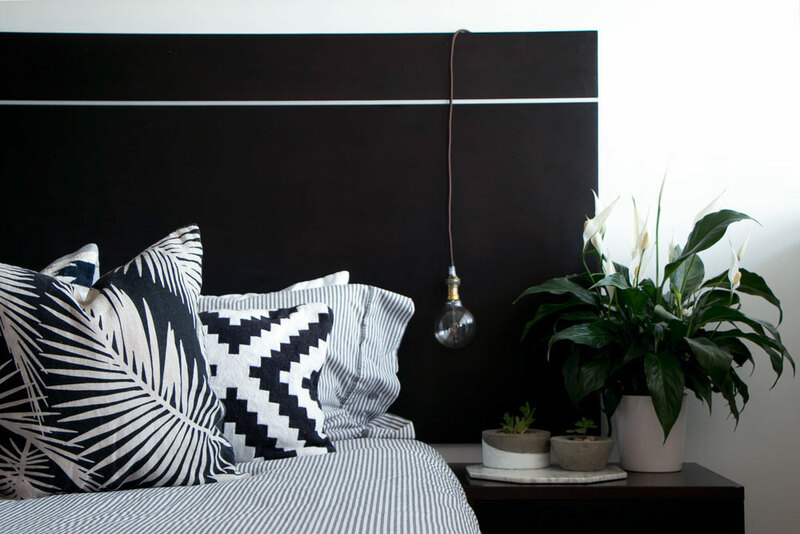 Plus when you’re in the land of limbo, between renting and buying, they are the perfect solution to update a bedroom effortlessly and with style. I recently made these DIY cement diamond pendants and I made sure to choose cement that suited our interior colour palette. What do you think? Do you like them? I think I might make a few more for the rest of the house! REVITALISE WITH BEDDING I love the feeling of freshly washed bed linen; even more so when it’s brand new. Updating bed linen – sheets and duvet covers – makes a world of difference. I used to love cotton sheets but over the last couple of years I have transitioned to linen. I find this fabric keeps me cool in summer and warm in winter. I also love the crinkly look of linen; there is something earthy about it. To make a quick update to your bedroom, change your bedding. I love white sheets as they make a bedroom feel spacious and bright, and I always had a white duvet cover in a different texture, such as waffle. However I started shying away from keeping everything so white at the beginning of last year. I also found it a little too ‘beachy’. So I swapped my plain white duvet covers for prints and block colours in neutral tones to compliment the look and feel both Jason and I wanted to achieve. THROW DOWN A RUG I’ve always loved floor rugs, you should see how much here! However I have really struggled to find a rug that not only compliments our interior style, but also fits within our budget. Floor rugs in Australia are very expensive. However I managed to pick this rug up from Super Amart - and I love it! It’s the perfect size and colour, and above all – it was only $299, so good! It is the perfect updater for our bedroom. And placed underneath the bottom end of the bed, a rug adds a fresh new look to any bedroom. In fact, Super Amart have some of the best updaters for a bedroom space if you're in need of a fresh change. And for more rug inspiration, have a look over here. INSTANTLY UPDATE CUSHIONS Nothing updates a bedroom more than cushions. Not only are they an affordable solution, they can also completely change the overall look and feel of a bedroom. At first I started with the black and white Aztec cushions, but over time I have updated the bedroom with cushions I find on my travels. Whilst the prints are different, they are all still very tonal, which is essential. MIRROR, MIRROR My parents own a holiday apartment and I am always so surprised at how large it is when I walk in; except after a few altering seconds when I realise the space looks a lot bigger because one wall is covered with a very large mirror. To stylishly update your bedroom without busting your savings, think about adding a floor or wall mirror to the space. PAINT THE WALLS A fresh lick of paint is one of the easiest and most inexpensive ways to put life back into your bedroom space. I always prefer shades of white, but you could also include a feature wall. Whether it’s paint, wallpaper or decals (otherwise known as removable stickers), they can all be easily updated when your style evolves. If you’re renting, like us, best to ask the landlord first! We did and we spent last summer painting the walls white in the apartment – it’s so much lighter and brighter in the apartment now. Bonus! GIVE IT LIFE I cannot count the number of plants in our apartment on my fingers, but if I had to give a number, it’s in the ballpark of 15… And we live in a two-bedroom apartment. Indoor plants are amazing because of their air purifying qualities. Not sure which ones to buy? Too easy! I personally love Peace Lillies, Bird of Paradise, Chain of Hearts and Ferns. These are all very hardy and look very cool in any space. SHELVES Storage is key when it comes to keep a space tidy, so invest in a few free standing shelves in your bedroom. There are a few cool styles going around at the moment, so if you are looking for shelf inspiration head over here. BEDSIDE TABLES One of the easiest and more functional ways to update your bedroom on a budget is to change your bedside tables. The best places to look are garage sales, second hand stores, timber yards and jumble sales. Last year I bought two timber stumps to use as bedside tables, however my boyfriend already had two bedside tables. So we are currently using his and have repurposed the timber stumps to elsewhere in the apartment. THROWS Possibly the cheapest way to stylishly update your bedroom on a budget is to buy a new throw for the bed. My biggest tip however is to make sure it actually serves a purpose, than just to throw onto the bed to look good. A throw should also be used as a blanket on cold nights. MOVE AROUND To give a free instant update to your bedroom space, have you considered moving your furniture around? If possible always factor in Feng Shui, a Chinese philosophical system of harmonising (furniture in this case) with the surrounding environment. However if this is not completely possible, an interiors expert has told me it’s ok to have one, maybe two, elements out of balance. Quick tip? Pushing furniture up against the walls of a room makes it look smaller, so give your bedroom breathing space by pulling furniture away from the walls – like we have done with our bedside tables. CHANGE CURTAINS As a minimalist, I believe that curtains shouldn’t be a feature in the bedroom. They should match the walls in your bedroom or at the very least, block out the sun. So if you are looking for ways to update your bedroom on a budget, consider investing in new curtains. Keep your budget in check by considering white painted timber blinds instead of big heavy drapes. Jason and I are both morning people, so we don’t like waking up to a dark bedroom. But if you do, choose curtains that are blackout – although these tend to be a bit more expensive! This is a collaboration with Super Amart. Concept and copy by Jaharn Giles from Mister Weekender.